Also, do they have apartments with 2 separate bedrooms (not just beds in the sitting room area)? On behalf of my wife Sue, & my two children, (Christian & Megan) I would like to say a big thankyou to everyone at Ionian Sun for providing us with such good accomodation. The pool/bar was excellent, the staff friendly (Peggy was very helpful), all in all a place I would without hesitation recommend to all our friends & family. Despite that steep climb to our apartment which we eventually got used to, we had a great holiday & really want to go back, (tommorrow). the best place on the best island in Geece,clean,frienly,stunning views,fantastic beaches,excellent pool.Have already booked for this year!!!! in september fith time.If your going earlier,please feed the cats. ps.dont worry about the eathquakes,when we went on our honeymoon the earth moved for us!!!!!! Had a great holiday at the Ionian Sun. We were in the top apartments - dont underestimate the climb up the steps, they are a killer in the heat of the sun or if you are carrying anything. When we arrived we were having to take a break half way up but by the second half of the fortnight we were doing it in one. The advantages of being at the top are that you are away from any noise from the bar and being already way up the hillside, the walk up to Lourdas village and the likes of the great Muses bar is more feasible. The one bedroom apartment was spacious and very well equipped. The view from our balcony was partly obscured by an old olive tree but otherwise there is a great view of the ocean. We've just had a fabulous holiday at The Ionian Sun. We stayed in the top appts. with a fantastic view,(lovely to hear the sea whilst enjoying a drink on the balcony!) We have 2 boys and were all happy to walk the steps,the boys enjoyed counting them. Great location with sea close by. Would definitely go back. We chose a 1 bed apartment to avoid the so called "dungeon like" studios. However, when we saw them, they looked great and speaking to people who were in them, they were having a lovely time. I think those comments are a very poor representation. We were in the top apartments which, for Greece, were really very nice. None of the usual bare wires hanging out of holes in the wall and big brown stains from insect repellant machines. Everything worked, was spotlessly clean, the air con. was included in the price and the view was unbelievable. Tall fir trees against violet blue sea... The 140 or so steps to the top block are well maintained and adequately lit. I would still stick a small torch in your pocket though. My wife and I are in our 30`s and fairly fit, so we didn`t have a problem going up and down here a few times a day, but if you are planning on carrying young kids and all the associated equipment up and down, or are disabled or seriously out of shape, it may be difficult. To be honest, we quite enjoyed it, because it was very shady and quite pretty. Pool and pool bar were good, although we tended to use the beach. I thoroughly enjoyed my holiday here, and although i probably won`t go back to the same appts, as we never do, I wouldn`t have a problem going back or recommending them. Just returned from 2 weeks in studio on ground floor, down by the beach. It wasn't dark or cave like at all!! The studio is light & airy with great facilities and the grass area was very handy for (sheltered) late afternoon sunbathing while the wind blew a gale on the beach. The Ionian Sun Apartments are really lovely, We too heard about the dungeon like studio apartments and were dismayed when we were put in one of the ground floor studios on our arrival, however, they are really lovely, easy access to the beach, they have a small patio and are very clean. The allotments are interesting and not noisy at all. If you want a quiet an dpeaceful holiday - sun, sand and a great pool too, this is the place to be. We have just returned from the Ionian Sun on 13 June 2006 and would definitely go back and would also stay in another apartment. Hi all, can anyone tell me which block the studio's are in? I have been into the travel agents and they found a week in a studio apartment at Ionian Sun but could not tell me where the studio's are. Have read on here that someone stayed in a ground floor room and it was dark and had awful views- just want to avoid that! Any studio info. would be great! Many thanks. Just returned from an idyllic 2 weeks at this hotel. Great pool & bar. The bar has sky tv to keep up with the cricket & football and large beers are 2 euros (oh & there's ice creams for the kids + it serves food snacks etc.) The hotel is well placed for the beach & tavernas on the sea front. The staff are v. friendly, especially Angela in the on site minimart, which is well stocked for self caterers. Couldn't fault this hotel at all (even heard they are refurbing the sea front appts this winter which should make it even better). Would seriously consider going back next year it was so good. We have just returned after a fantastic two week holiday. The Ionian Sun apartments are excellent, so clean and such a perfect position. We were lucky and had a pool and sea view. Lovely people both working and holidaying! Our children loved the pool and all the friends they made, (Hi to Hollie, Gavin and Eva). Bedding/towels changed every other day. Staff very helpful especially Peggy. Thanks for a wonderful holiday. Just returned from a fantastic week at the Ionian Sun Appartments - the appartment complex is excellent, staff helpful and friendly and the resort is beautiful, you can;t help but relax. Car hire is recomended to see the rest of Kefalonia - which is beautuful. all i can say is excellent!!!!!!!!!!!! Over priced and over rated. If you are going then insist now that you will not take a ground floor studio, the views from which are generally poor.From number 14 the view is primarily of a steel garden shed in the allotments which lie between the apartments and the beach. A beautiful pool but, nevertheless, very poor value and in a resort which is a bit of a dump. Great Apartments Ideally situated for the beach. Very clean and very friendly staff. My thanks to Mo and Bob for loads of info. Also if you have a drink at the bar and Bob is serving try and get him to serve you his special myrtos bay beer! 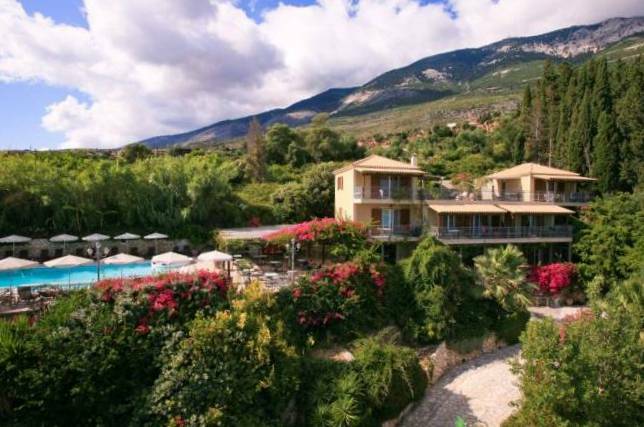 Email address please of the Ionian Sun appartments or telephone number as we cannot find details in Manos Brochure. How far way from the beach are you ? and we need an appartment for 4 adults and what company do we bokk through ? wonderful place to stay, been twice before and going back again next year. dennis and his staff are very friendly and make you very welcome, and danae kept us entertained at night at the poolside bar, a must place to stay.